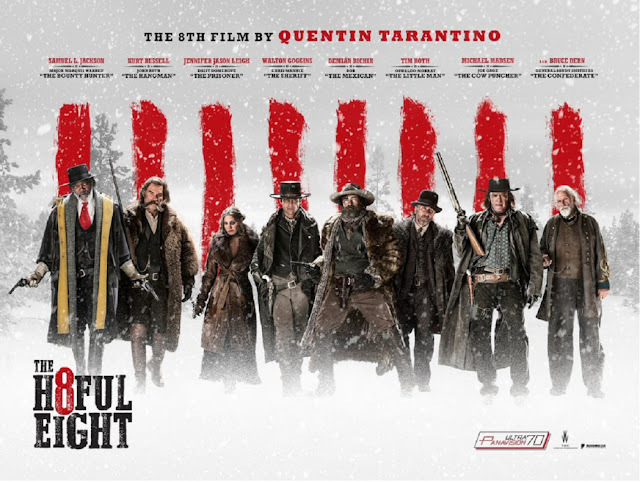 Movie Ramble: The Hateful Eight. If there is one single thing that makes Quentin Tarantino’s eighth film really worthwhile seeing it’s the riveting portrayal of the ‘Susan Atkins of the Wild West’ Daisy Domergue a.k.a The Prisoner by Jennifer Jason Leigh. 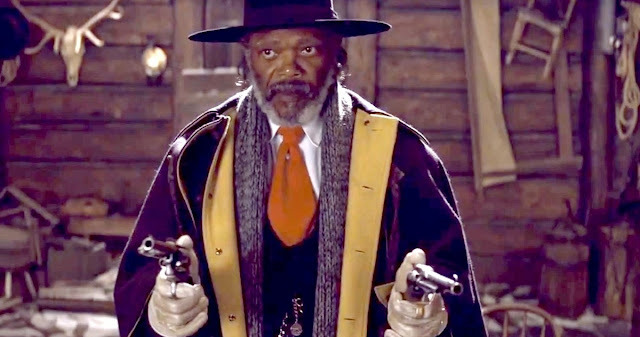 The Hateful Eight (2015) is split into six chapters and we first meet Daisy in a stagecoach handcuffed to bounty hunter John Ruth a.k.a The Hangman (Kirk Russell) on their way to Red Rock where she is to be ‘hanged by the neck until dead’. Delays to their trip are incurred when firstly Major Marguis Warren a.k.a The Bounty Hunter (Samuel L Jackson) flags down the stagecoach to hitch a ride to transport his three dead bounties and then ex Confederacy Officer Chris Maddox (Walton Goggins) who is also on his way to Red Rock as the town’s new sheriff blags a lift. Driving the stage is O.B. (James Park) who suggests because of the impending snow blizzard that they rest up for a couple of days at a stop over known as Minnie’s Haberdashery. Already taking shelter there are Bob the Mexican (Demian Bichir), The Englishman Oswaldo Mobray (Tim Roth) who is also the man due to hang Daisy, Joe Gage (Michael Madsen) and the Confederate General Sanford Smithers (Bruce Dern) the scene is now set for our story to develop and the normal amount of QT violence to be discharged. 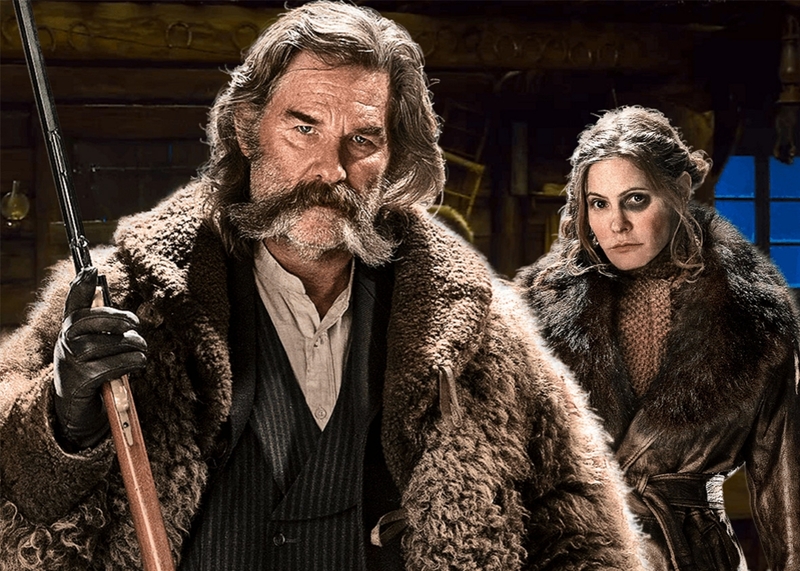 Tarantino’s second ‘western’ following 2012’s Django Unchained is a thriller in the true sense of the word mimicking the great western B-movies of the past and one that could easily be adapted as a stage play. It has a linear narrative that veers between humour and action based violence along with some cracking dialogue. The director who also wrote the story edited two versions of the film, the one shown on general release and a twenty minute longer version described as a road show version, which has an overture and an intermission! Filmed in Telluride Colorado, its Tarantino's first film to use an original score, composed by the master of the spaghetti western soundtrack Ennio Morricone. Regular cinematographer Robert Richardson makes a grand job of the winter landscapes and the interior of the stagecoach station where most of the action takes place. Contrary to the bad press due mainly to its long running time, which for me was not a problem, I personally found the movie engrossing, never for a minute boring, with an ensemble cast who like other QT movies were totally believable - in a comic book sense of cause.